"Quality care for your horse"
There's plenty of room for your agisted horse at Tassiriki Ranch. 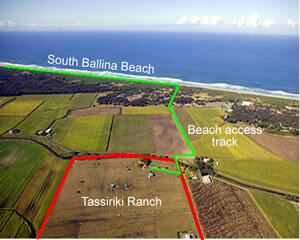 Situated on 39 acres of superb grasslands only 800 metres from pristine South Ballina Beach, Tassiriki Ranch offers the perfect location to agist your horse. At Tassiriki Ranch we offer fully-supervised agistment services ranging from simple shared paddock agistment to fully-serviced stables. In addition to the guest stables to the rear of the holiday cabins we have 10 stables with night yards and grazing paddocks for those owners wanting that special treatment for their horse. We also have 7 large shared-paddocks with shelters for the budget conscious owners. All our facilities are available for short and long-term agistment. Our training facilities consist of a 60 metre x 20 metre grass arena, a 16 metre diameter galvanised round yard, and a large jumping paddock with various adjustable heights jumps. At Tassirki Ranch we care about the safety of our guests and their horses, we have recently installed new boundary fencing (solid timber post with 4 wire and white horse-sighter top wire) and internal fencing (solid timber post with 3 wire and white horse-sighter top wire). All our paddocks have automated drinking water so your horse will never go thirsty. Our new easy-access laneway allows you to virtually drive right up to you horse. Off-street parking for cars and floats allows safe loading and unloading of your horse, and there's also a convenient wash-bay in the laneway for use after your big ride. At Tassiriki Ranch we have a documented Biological Security Plan to manage the risk of disease spreading amoung horses on the property. All new arrivals destined for shared agistment paddocks are vaccinated and wormed then quarantined in private stables for 21 days prior to moving into the general population on the property. 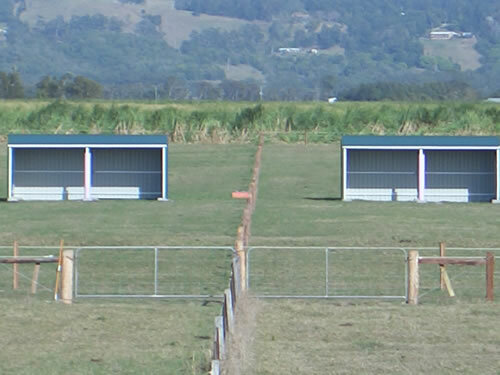 Shared use of a large paddock with safe and secure fencing, a large shelter, and automated drinking water. Shared paddock agistment is arranged on a same gender basis with no more than four horses per paddock. You're so close to the beach you'll find yourself horse riding more often, and training your horse on the sand is a great way to get your horse in shape or to maintain existing condition. NOTE: HORSES CROSSING THE BORDER FROM QLD INTO NSW MUST STOP AT THE BORDER AND BE SPRAYED FOR CATTLE TICK. AN $11,000 FINE MAY APPLY FOR INTENTIONALLY AVOIDING HAVING YOUR HORSE SPRAYED.